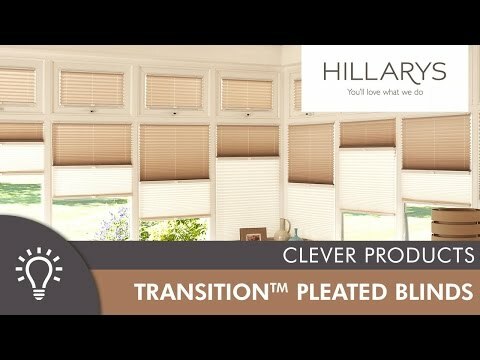 For the ultimate in flexibility, consider a Day & Night Transition™ blind from the Hillarys Pleated blinds collection. It’s such a good idea; two fabrics are combined within one blind with a very discreet rail fitted between the two. This thoughtful design means the fabric at your window can change when you want it to. For example a sheer fabric will provide privacy while letting the light in during the day. While a blackout fabric will ensure a cosy and dark environment at night-time. Arrange an appointment to see our entire range of Pleated fabrics and to get an accurate quote for made-to-measure Transition™ blinds for your windows. With fabulous plains, patterns and textures to choose from, as well as blackout, sheer and reflective options, Pleated blinds are as versatile as they are beautiful. Now Day & Night Transition™ blinds allow you to combine two of these fabrics together at one window.